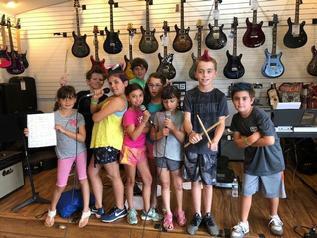 We are now accepting registration for Rock Band Camp 2019. Click on the picture to watch a video about this fabulous program! An Extraordinary Summer Rock Band Experience for All Instruments and Voice Ages 6-17. This summer give your child the chance to find out what it is like to be a rock star. Students are placed in bands with others at a comparable level, and each band is assigned a manager (one of our instructors) to guide them through the songwriting and rehearsal process. Bands work on writing all their own material, lyrics and music. In addition to performing skills, band members are taught how to promote their band, how to project themselves on stage and how to operate sound equipment. Students are also given group lessons focusing on the skills they need to play with their band. They watch their peers perform and top off their musical adventure by playing a huge show at a local venue or outside. If you are interested in information on this unique summer program contact us anytime. All levels are welcome to particpate. Students are grouped by age range. In addition, all instruments are welcome including brass, woodwinds, and strings. We also welcome kids that are interested in stage crew like props, sets and lighting. They will assist with putting together the peformance we present at the end of the week for the rockers and the musical theater group. We are now accepting registration for Musical Theater Camp 2019, click the picture to learn more! An Extraordinary Summer Musical Theater Experience for Theater Enthusiasts Ages 6-17. For 18 summers, Mike Risko Music has been offering summer music workshops for kids who want to be rockers. In the past few years we expanded this program to also include musical theatre. During this one-week intensive summer workshop, students have the opportunity to star in a musical production with guidance from professional voice and acting coaches in a fun, summer environment. Using songs and short skits from popular musicals, everyone will get a lead and a chance to shine. Each day students will work on skills that make them stronger singers and actors. They will help create a show based on characters and songs from shows that they choose. They will participate in everything from concept to completion as they prepare their finished product to be performed on the last day of the summer workshop. This is an incredible production in which friends and family are invited to see their unique show. They will learn to project themselves on stage while building confidence through acting and singing. Students are also given the opportunity to chose electives throughout the day like a voice or theatre class. They also will participate in working on minimal sets and costumes during the art portion of the day. They will get to know other kids at the workshop who are enrolled in the Rock Band Camp and each day will perform in the afternoon showcase along with them. Read about the Mike Risko Rock Band Camp concert at Louis Engel Park at the Ossining Waterfront right here.